In a prior article, you learned the real reasons why people procrastinate, in addition to some of the most the common ways that people postpone action. While some of us procrastinate more than others, everyone procrastinates at times. In this article, you’ll learn how to stop procrastinating. Before we discuss that though, let’s first consider if and when procrastination could actually be a good thing. Is procrastination always bad? Can it ever be good? Delaying an important decision if you don’t have enough information yet to make an informed choice. Holding off on a trivial task that pops up when you are in the middle of working on something that is more important or urgent. Staying in a job that is dull, but secure (instead of bolting for a start-up that is exciting, but very risky) if your family situation requires that you have a stable income and predictable schedule right now. Sometimes, procrastination is in your best interest. The key is being honest with yourself about when procrastination is driven by good judgment, rather than just being used as a stall tactic. If one or more of these reasons is really what’s driving your procrastination, recognize that there are negative consequences of inaction. Waiting until the last-minute creates unnecessary stress and anxiety, and it will cause other problems, too. There will be situations when you will underestimate how long something will take to complete, forcing you to make a hasty decision or to submit work that is sub-par. Always waiting until the end also makes you more likely to miss or forget about deadlines altogether. In comparison, doing something early creates “free time” and prevents unnecessary anxiety and stress from having to scramble at the end. Unless waiting is in the best interest of you or someone else (as noted in several examples above), you might as well start sooner rather than later. Let’s look at three practical ways to stop procrastinating, when taking action now is in your best long-term interest. If the answer to that question is “yes,” then ask yourself this question: “Can I make time to start or decide on this now?” If the answer to that question is also “yes,” then start or decide immediately. 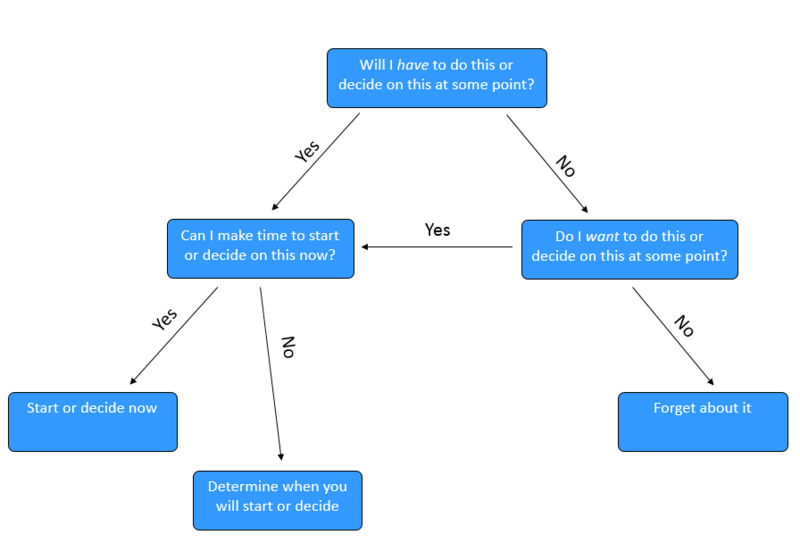 The following flowchart provides guidance on how to proceed for other scenarios, such as situations when you cannot make time now. In those cases, the goal is to identify a specific time when you will start or decide. That way, the task/goal/change/decision isn’t just left hanging over your head for whenever you remember to begin and feel like taking action. Focus on the benefits of taking action. Fear is often the real cause of procrastination. Fear is part of being human, and everyone feels fear at times. People who take action decide to move forward in spite of their fear. They refuse to allow fear to hold them back from pursuing their dreams and creating a better life. They move forward by focusing on the benefits on the other side of fear. If you are afraid to speak with a friend who you upset, don’t focus on how the conversation could be uncomfortable. Instead, think about how much better you would feel after apologizing and making up with your friend. If you are afraid to have a medical procedure done, don’t focus on how the procedure could be scary. Instead, think about how relieved you will feel once it is finished and how the procedure will reduce your current or future discomfort. If you are afraid to start your own business, don’t focus on potential failure. Instead, think about how great it would feel to be your own boss and to start something that has a positive impact on the world. Get clarity and direction on the first (or next) step. If you are overwhelmed or confused about how to get into better shape, you could research personal trainers or health coaches in your area, you could contact a fit friend for some advice, or you could get a book on fitness. If you are overwhelmed or confused about how to change careers, you could research career coaches in your area, you could get some advice from one of your mentors, or you could get a book on how to make a career change. If you are overwhelmed or confused about how to get organized, you could research professional organizers in your area, you could get some advice from an organized friend, or you could get a book on how to get organized. Do not allow yourself to feel paralyzed by the perceived magnitude or complexity of what you are trying to accomplish. You have probably built it up in your head to be more difficult or more complicated than it really is. Either way, chances are there are many people or resources that could help you simplify and clarify the process. Break down your task/goal/change/decision into a series of smaller steps or bite-sized habits that you can repeat. 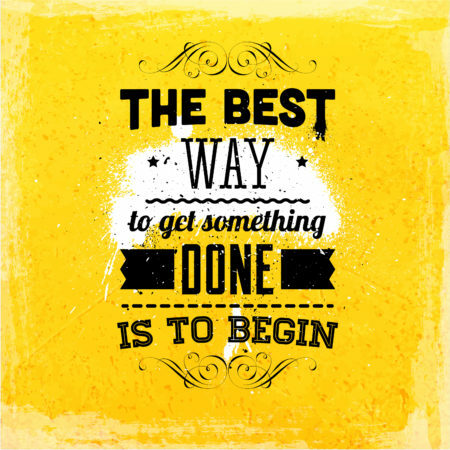 When you have clarity and direction on how to get started, the urge to procrastinate will dissipate, and you’ll be more likely to start moving forward.